It is a journey of adopting innovative technology and methods. Whether you are a startup, a mid-size enterprise or a huge corporate, digital transformation is essential to reshaping your organization. It is the most structured and effective way to redefine your existing business models and experiment with new ones. And it is only through this journey that you can gradually or simultaneously transform your operations, competencies, employees, and leadership. 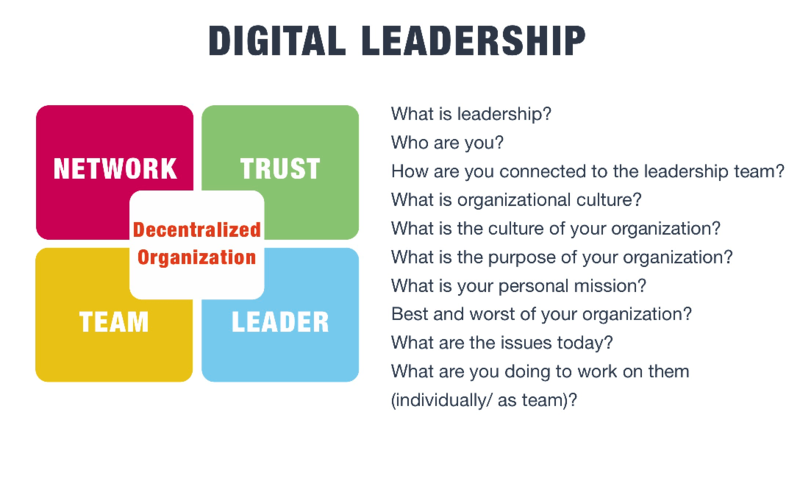 The top segment of the infographic touches on Digital Leadership. Digital transformation framework starts at the top of a company. It starts with a focused vision that is often created and led by senior management. And then it is carried out by the mid and lower-level employees. There are plenty of examples where executives have digitally transformed parts of their businesses. But they are always confined to the boundaries of their own units or departments. 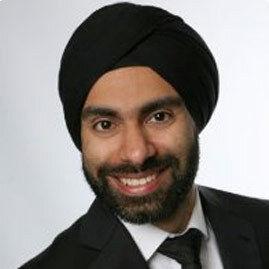 Unable to break through silos that so rampantly exist in companies. The top management has to be in the driving seat for a company-wide digital transformation. The questions asked in this segment will help you reflect on the state of your company’s leadership. But as a first step, the senior management must agree that digital transformation is necessary and that they need to transform as leaders too. 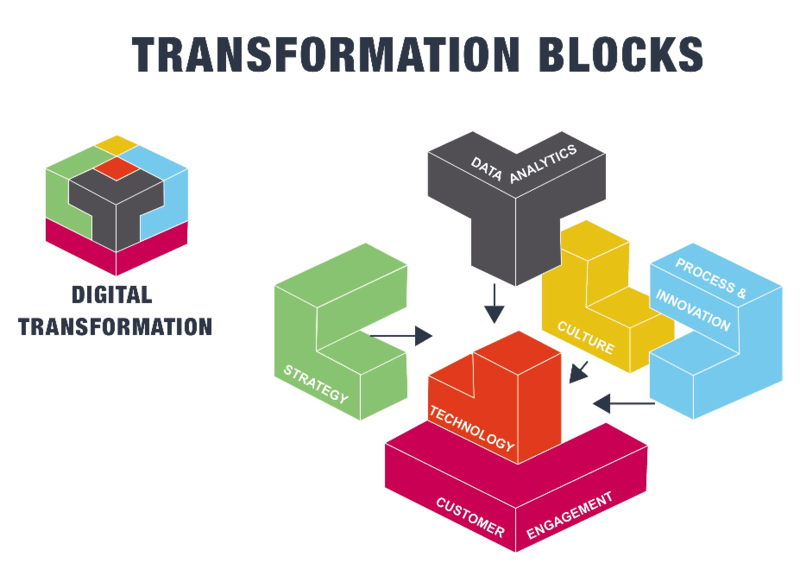 In the next section, you see the six basic building blocks that make digital transformation possible: Strategy, Process & Innovation, Culture, Technology, Customer Engagement, and Data Analytics. Often digital transformation framework is only seen as part of technology and IT. That’s a myth. Digital Transformation is about adapting to change in every department of a company, starting from its top-most employees to the most low-level ones. 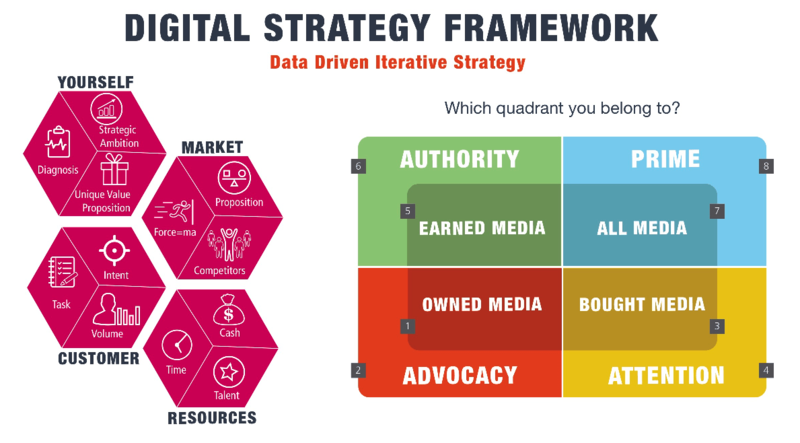 The next section of the infographic focuses on Digital Strategy Framework. With the help of the given digital transformation framework in the poster, you can create a data-driven iterative strategy for your company. Advocacy: You grow your business organically and every customer acquisition is done face-to-face. You are trying to get the word out through your own content/blog. Attention: A large part of your business comes through social media channels and running ads. You seek attention by pushing ads. Authority: You have created something so innovative/disruptive that it has gone viral. The media is talking about you. Prime: You grow your business using all the methods available in the market. You are the market leader in your industry and region. Yourself: What is your value proposition? What are your goals? Market: How much competition do you have? How is your competition doing in the market? Customer: Who are your existing customers? What customers do you want to target? Resources: What kind of resources do you have and what more do you require to achieve your goals? All your answers must be supported with real data evidence. This framework will allow you to create a strategy that will be iterative and will change as you find more data. Your decisions and journey will be data-driven. After building a strategy, the senior management must decide whether as a company they want to create new business models, re-invent existing business models or do both. For most companies, it can be challenging to create a new business model with their existing resources and ways of working. We have interviewed over a dozen C-level executives of Fortune 500 companies that complained about transforming their businesses too quickly. They say it seems too overwhelming. You cannot expect a huge corporation to remodel itself as a startup overnight. It’s too big a risk for them. They cannot put years of their investments and revenue channels online just to follow a new trend or an idea that may or may not be disruptive. There is too much change happening in too little time. Every day a new tech trend is emerging. And for huge corporations, it can be difficult to cope up with so much disruption without throwing away their legacy of work. In the next section of the infographic, we show how an established company can create a new business model by bringing about small, innovative changes to their existing way of working. The company must create a new department that can run like a separate entity outside of the company’s core business. And to run this department, the company must hire an independent team with an innovative mindset or outsource their innovation completely. It should follow the philosophy of Lean Innovation: Don’t let perfection get in the way of your progress. This department can function as a startup. 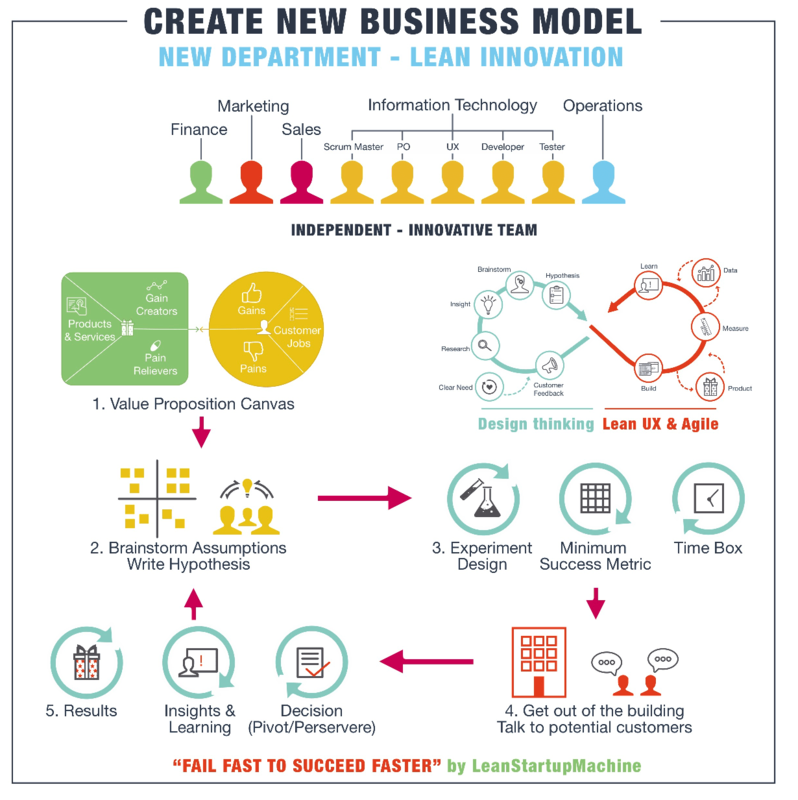 It can follow the lean startup principle of testing and validating various ideas. It can scale up those ideas that are validated successfully with data as evidence. 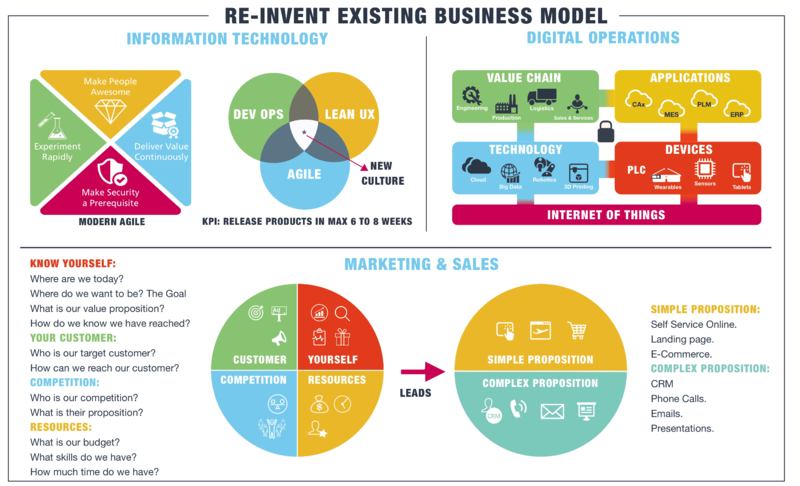 On the left side of this digital transformation framework, you can see how a company can re-invent its existing business model by bringing about innovation in processes, procedures, costs and product management. In a traditional IT setup, it takes two to three months to get business requirements, another six months or so in the development phase and another two to three months in testing and deployment. The modern agile setup brings all of these elements together in one cross-functional team, thus making the entire process very seamless. The waiting period between different teams gets reduced, communication becomes more effective and there is more efficiency in the system. Under the Lean UX, the team directly talks to the customer to get requirements. These requirements are promptly turned into a prototype that is validated by the customer. The agile methodology enables small cycles of development thus ensuring continuous customer feedback. DevOps bring about automation in testing, deployment, and integration. 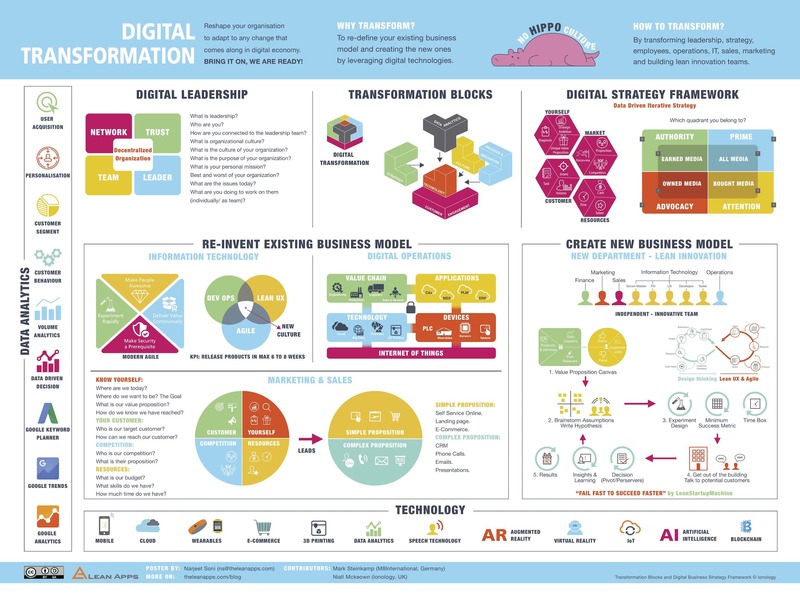 We kept Technology (IT Digital Transformation) as a horizontal bar at the bottom of the infographic because it is just an enabler of Digital Transformation. As a company, you don’t have to adopt every new technology in the market but only those that are relevant to your business models – both new and existing. Data analytics is depicted as a vertical bar in the infographic because it is necessary that data be plugged in every aspect of your business. Data is one of the most important assets of your company. Your customers, employees, and machines create tons of data every day. And you can leverage it to generate important insights into every touch point of your organization. You must replace all your gut-feel or intuitive decisions by data-driven decisions. yourself or did you hire sommeone to do it foor you? the greatest I have discovered so far. But, what concerning the bottom line? Get a free time and cost estimate of your app without worrying about sharing sensitive information. Let’s check whether your idea has a good business model and has the potential to be successful.